These rolls are so fresh and light, and quite simple to throw together on a hot summer's day. Turkey breast is a great piece of meat to work with - it's lean, full of protein and easy on the pocket book. Marinaded in my favourite coconut milk/curry paste/pineapple concoction, it grills up tender and tasty. 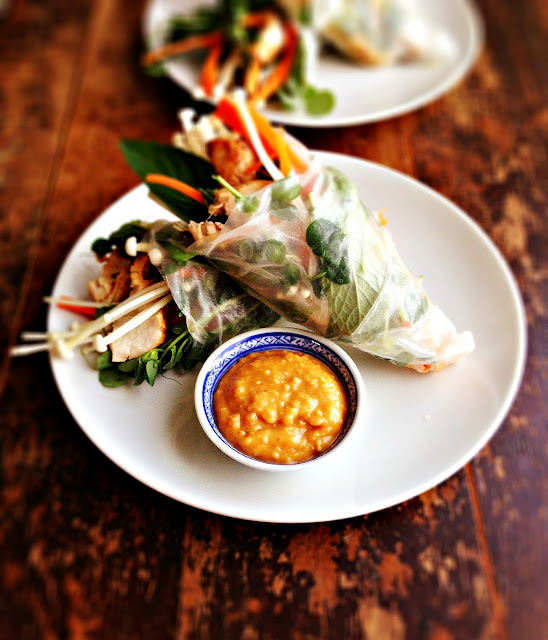 Thinly sliced, it gets wrapped and rolled inside rice paper rounds with fresh veg and herbs. Enoki mushrooms are real beauties, aren't they? Their delicate flavour and complimentary crunch really finish off these healthy rolls perfectly. So slender and crisp, it's like they were made for tucking into salad rolls. (I kind of love how their little heads peek out). And of course, every good salad roll needs a good peanut sauce...if I could smother all of my food in peanut sauce I totally would. I know you're dying to have the recipe (and the e-cookbook!) and you can find it on the Mushrooms Canada Facebook page. Just click to download and you're good to go! Be sure to go to the Turkey Farmers of Canada Facebook page for the second part of the e-cookbook (I might just have another recipe tucked away there!). Happy grilling! Gorgeous! I want some right now. Holy smokes! These look ah-mazing! Hello, pretty! These look amazing and I love the flavour combo. These just look so delicious! Gorgeous photos! Brittany - thank you! I had loads of fun making (and eating!) them. Jan - thanks a bunch :) There's lots of good stuff going on inside, that's for sure. GAH! 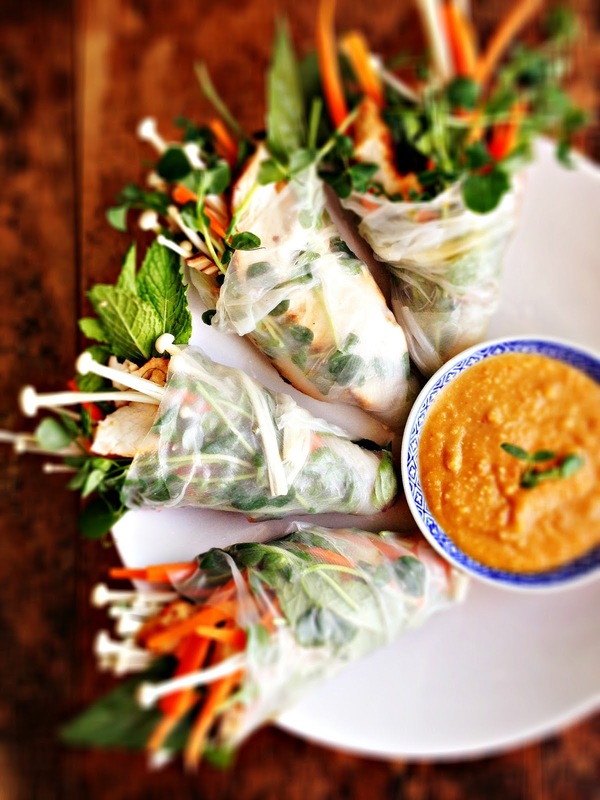 This is just to say that a) these salad rolls look next level awesome, and b) your photos? DON'T GET ME STARTED. Perfection. Also, enoki mushrooms are the best thing ever. These salad rolls look so refreshing. 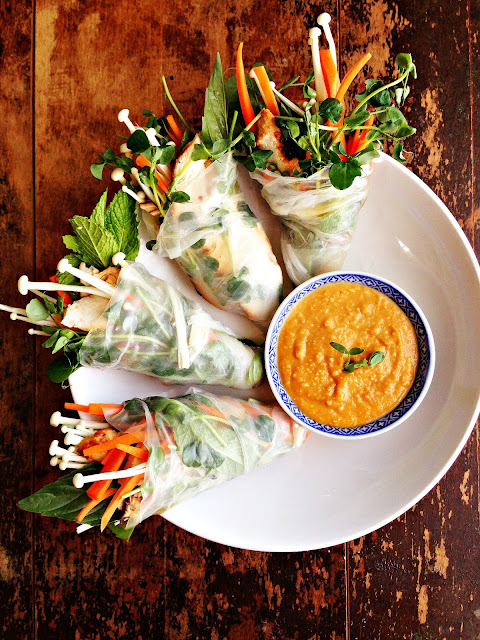 Did you make your own peanut sauce? Do you have a good recipe to share? A lovely looking dish! So glad to hear summer has arrived. I see you've been up to all kinds of goodness lately. I'm catching up on back blog posts. These rolls looks amazing!!! What an amazing entree when you have guest over! I'm sure everybody would be so impressed by these little beauties!